Meet the dynamic young people between the ages of 10 - 19 who were selected to participate in the 2017 Sea Youth Rise Up initiative in NYC. These individuals have demonstrated their passion for the ocean and have taken real action in their local communities to raise awareness about the importance of protecting our blue planet. Max is a rising senior at Newark Charter High School in Delaware. He harbors an extreme passion for protecting our world’s oceans and specifically enjoys studying both greenhouse gas emissions and plastic pollution. Whether by organizing beach cleanups or participating in a horseshoe crab census, he loves giving back to his community. Max also participates in the Chesapeake Bay Bowl annually. Above all else, he wants to bring attention to the state of our ocean and what we can do to reverse the damage done to it. Nora Abdiruhman is a junior currently attending Western High School in Baltimore, Maryland. She was born and raised in Baltimore and lived on the Virgin Island of St. Croix for several years as a child. She is currently in her third year of an after-school program called AOW (Aquarium on Wheels) that is a part of the National Aquarium in Baltimore. This year, Nora is a director for the Baltimore Youth Ocean Conservation Summit (YOCS). This summit’s focus will be ocean health and what one can do to maintain a healthy ocean. She has also been a part of the Henry Hall Summer Program for 5 years. Nora has attended both MAYA! and the YOCS. Nora has also attended and assisted in multiple robotics competitions with her school’s robotics team. She has re-implemented the MSA (Muslim Student Association) at her school in hopes of connecting the Muslim community and educating her peers on what life is like as an African-American Muslim woman in modern society. She has two sisters and one brother, and is the proud owner of two tabby cats (one grey and one orange). In her spare time, Nora enjoys rock climbing, riding bikes, and reading. Keyla Corriea is an eighteen year that co-founded a globally-known organization called the Plastic Free Mermaids. Its mission is to spread awareness about Plastic Pollution through education, outreach, cleanups, and political advocacy. They also educate others on how to live a Plastic Free Lifestyle and partner with organizations around the world to spread their message about eliminating Plastic Pollution. Keyla have started Plastic Free Mermaids Chapters in Botswana and South Florida that are getting students engaged in making their schools Plastic Free, hosting their own cleanups, speaking to local legislators, and actively living a Plastic Free Lifestyle. She has also been on radios shows and a speaker at multiple summits, such as the Breaking Down Plastic Summit and the Youth Ocean Conservation Summit, where she is able to talk about the Plastic Free Mermaids and be an inspiration to others - encouraging them to make positive changes in their communities. Keyla has brought international students from Zambia, Botswana, and Lebanon to South Florida where they spoke about how to dispose of plastic, compared their methods, and helped implement new ideas. They then visited Keyla’s high school to interact with students that shares their passion on environmental and ocean conservation. 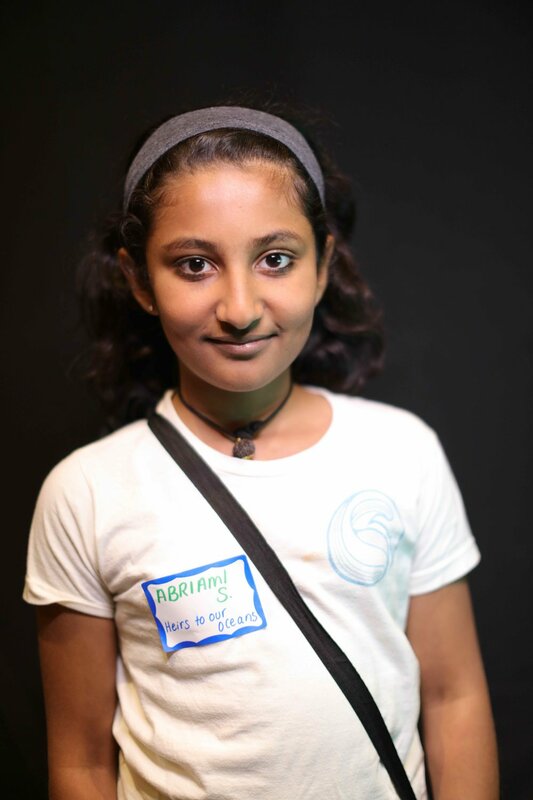 Abirami Subramanian is a 10 year old member of Heirs to our Oceans, a group of 17 kids of ages 10-13. Her area of focus in this group is Cetaceans, particularly dolphins and porpoises. Her love for the ocean began by sitting next to her brother as he studied fish. They would make frequent visits to the beach and the Monterey Bay aquarium. Abirami was taken in by the aquarium’s many different exhibits. She was particularly drawn to the otters since they were both cute and smart. She loved watching them frolic around underwater and come close to the glass. She would put her hand out to touch them, only to touch a layer of glass. Abirami will take her love for otters throughout her life. For some animals, Abirami has a strong sense of protection. Because she loves them, she wants to protect them. As time passed, she learned more about the ocean and the human threats facing it. While learning about these threats, she realized that animals are in danger and need a voice. She wishes to be that voice. Abirami has recently begun studying dolphins because they have a similar nature to the otters she used to see in Monterey Bay aquarium. Helen Zhao, age 18, started volunteering at Central Park Zoo two years ago as a Discovery Guide where she found her love for conservation. She was a part of her school's sustainability club and student government for many years, strongly advocating for recycling and building a living wall in the school hallway. Helen will be attending New York University in the fall as a International Business student. In her free time, she enjoys playing volleyball and running.